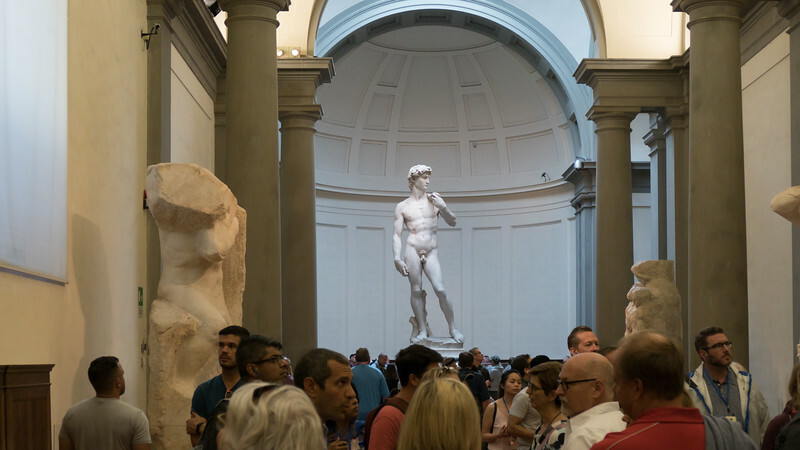 One of the great thrills of visiting Europe for many people is seeing Michelangelo’s David in the (stone) flesh at the Accademia Gallery of Florence. I knew it was going to be a thrill for me. 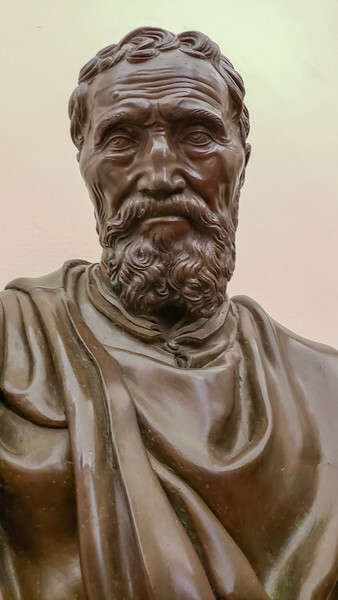 Michelangelo in my opinion is the greatest sculptor that ever lived, and there have been some great ones. 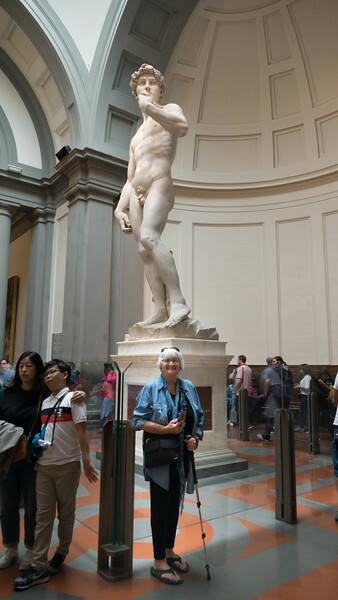 There are several “David’s” in Florence, and some might choose to skip the crowded gallery and simply view the copy that is placed in the square where the original once stood. Not me. 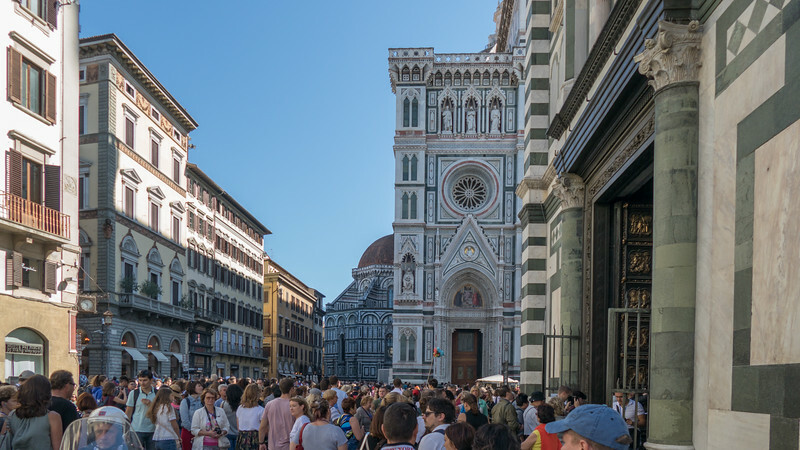 Several months before our trip I contacted the Accademia directly online and purchased our “skip the line” tickets for a day early in our visit to Florence. 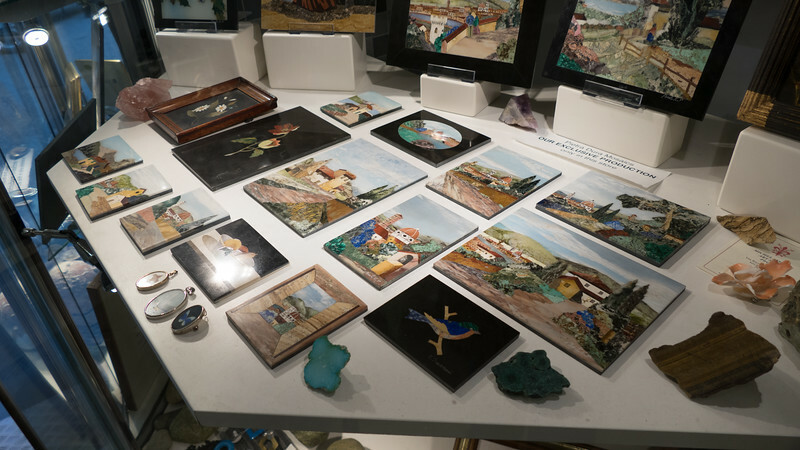 I decided that since this particular gallery is small enough to be manageable we could do it without a guided tour. Instead, we used Rick Steve’s Accademia Gallery Tour in the Florence and Tuscany book that was our little bible while visiting the city. Our entry time was at 10, and the Accademia is about 45 minutes to an hour walking time from the apartment. We left early enough to walk slowly enjoying the uncrowded streets. We arrived in time to enjoy a cappuccino and a croissant at a nearby cafe before our designated entry. Deanna and I both came to love those morning stops for capuccinno. I know that after a few days, in addition to the vertigo, I started getting a neckache from looking up all the time, always up. 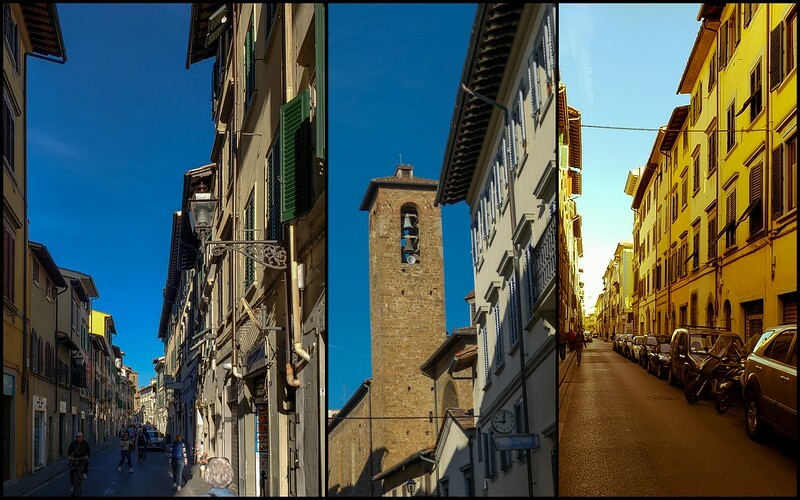 There is a lot of tall stuff to look at in Florence. This morning visit to the Accademia was perfect for us. I didn’t waste a lot of time initially looking at anything else, heading with single minded purpose to the room containing Michelangelo’s David. It is probably his most famous sculpture, of many, and not even my favorite. I love the Pieta that is in the Vatican most of all, but seeing his work in person, for real and up close is incomparable. Michelangelo was only 26 when he was commissioned to carve a large scale work for the Duomo. This particular block of marble had been rejected by other sculptors as too tall, too flawed, and too shallow to be valuable. 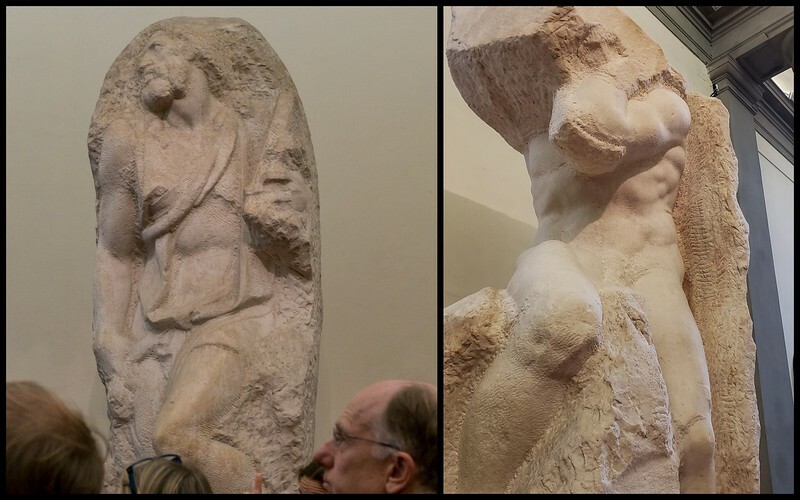 Much has been written about whether the sculpture depicts David before or after the kill of the Giant, of the purpose behind the huge outsized left hand, about the changing expression on his face as the statue is viewed from different directions. We stayed in the David room for quite some time, viewing from many angles, taking our turn up close to get photos. I was so excited about seeing it and didn’t mind in the least that the gallery was crowded with people, all vying for their position in front of the David. Some were being silly taking selfies, others posing for photos as I was, and others sitting on the benches along the sidelines contemplating the statue. After getting our fill of David, and finally leaving that part of the museum, we returned to the gallery we had passed through previously unseen with our eyes only for David. In this gallery were the unfinished figures of Michelangelo’s Prisoners. Michelangelo believed that as a sculptor he merely revealed the figures that God had already embedded in the marble. The figures are in various states of completion appearing to simply emerge from the stone as Michelangelo envisioned. 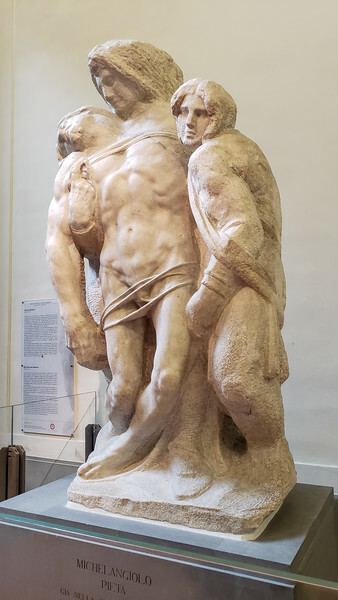 In the same gallery was another later, unfinished Pieta by Michelangelo and a bronze bust of Michelangelo himself, depicting a craggy, wrinkled old man at the age of 89, with the famous broken nose. 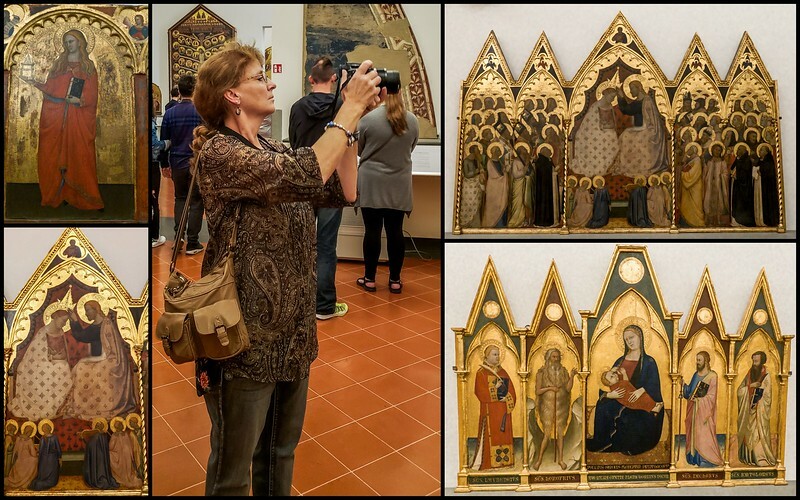 On the second floor are the Florentine Paintings, with altarpieces showing saints and Madonnas. 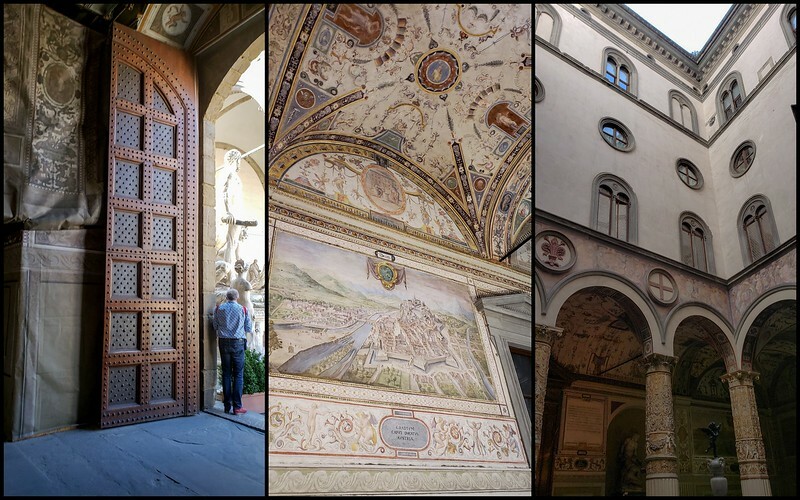 These paintings are from the last part of the Middle Ages, the time after the Great Plague almost destroyed Florence, yet before the Renaissance hit in full force. 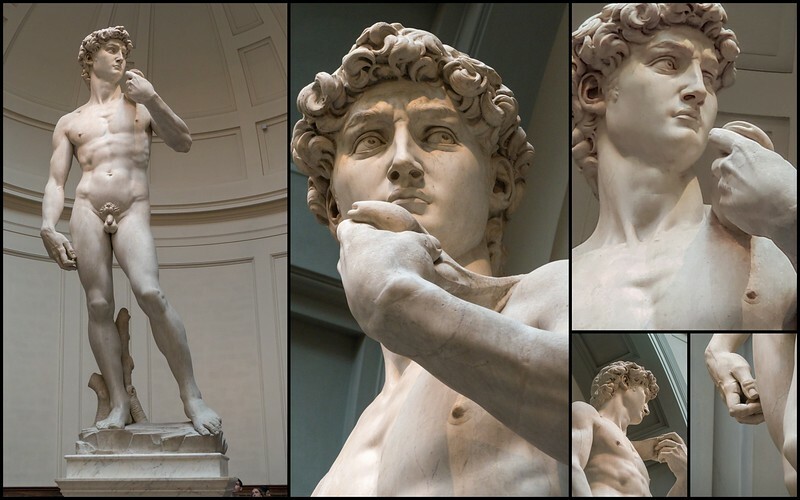 As we finished our tour, I wandered back into the nave where The David stood, and tried to imprint on my mind the actuality of seeing this great piece of art up close, in real life. Emerging into the early afternoon sunlight, we were a short 15 minute walk from the Duomo. 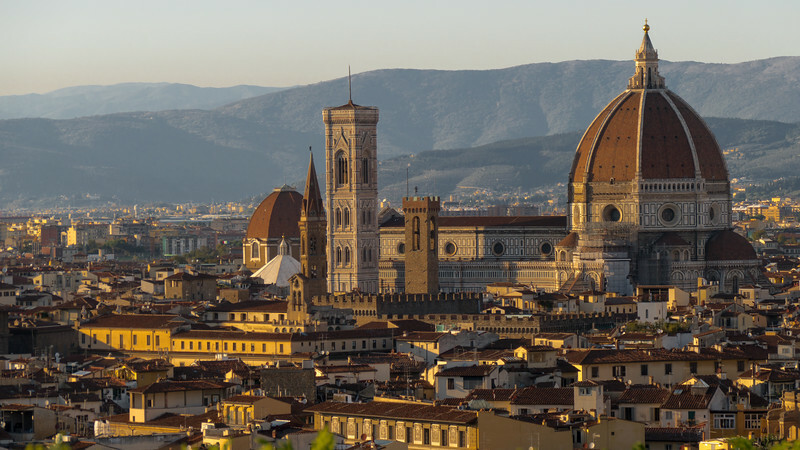 We had planned to spend the next day (Friday) climbing the Duomo stairs and viewing the interior of the great cathedral. With a bit of energy left to spend we decided to visit the smaller and older Baptistry this afternoon to simplify tomorrow’s explorations. 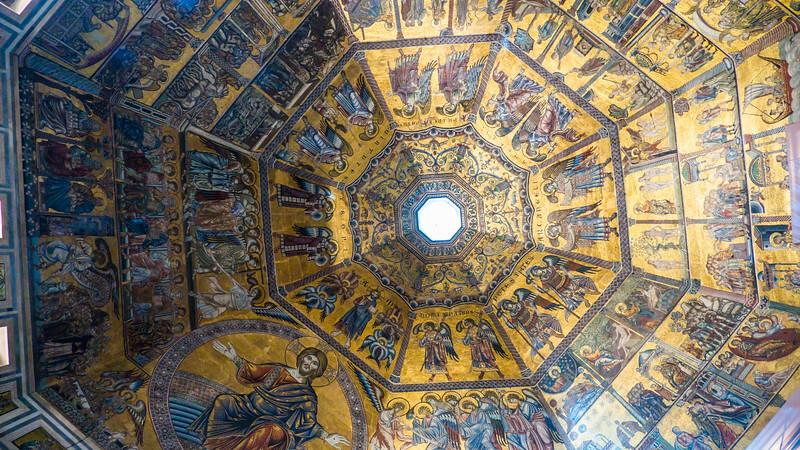 The Baptistry is Florence’s oldest building, built 1,000 years ago. 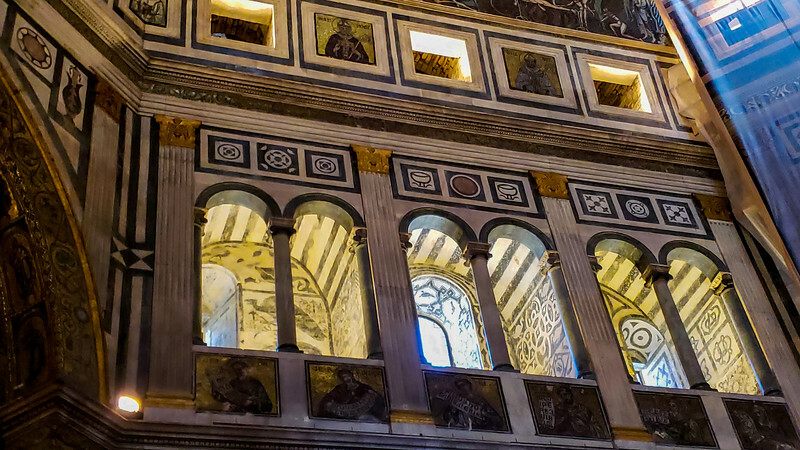 It is the soul heart of the Florentines, more so than the Duomo itself which is close by. The difference in the crowds by late afternoon was dramatic. 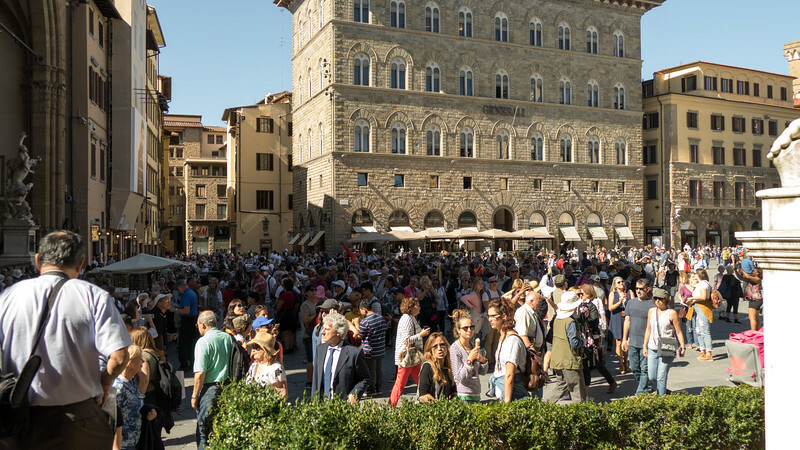 The piazza was teeming with people lining up to see the sights, eating in the cafes, and strolling the square. 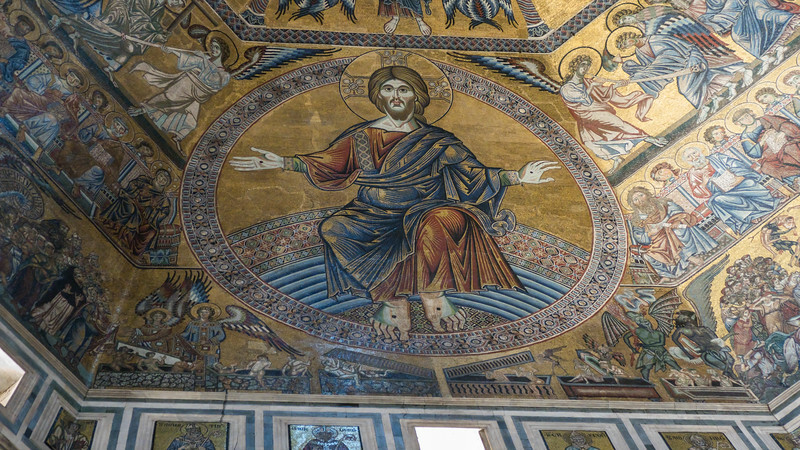 The interior of the great church is rich with ceiling mosaics made of Venetian glass, added to the church in the late 1200’s. The Last Judgment on the ceiling shows a glimpse of the medieval worldview where life was a preparation for the afterlife. Some of the scenes look like the hells of Dante with demons and monsters. Dante himself was baptized in the waters in this church. 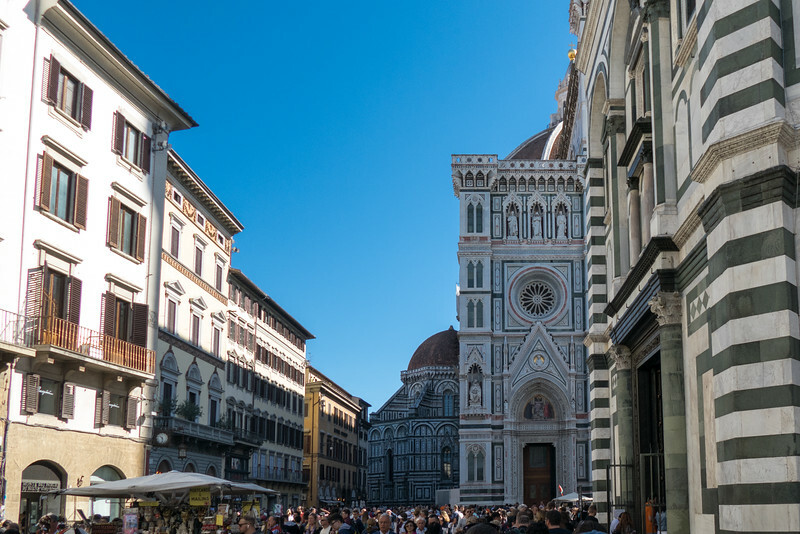 After leaving the Baptistry we braved the ever growing crowds and stopped at a few shops along the route. 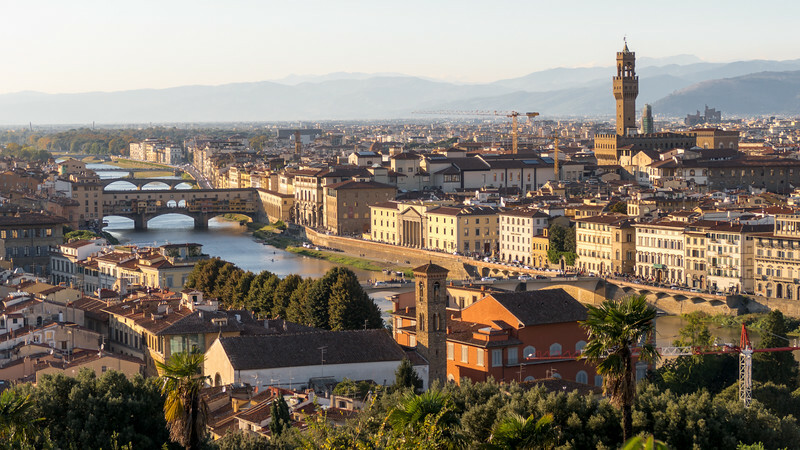 We discovered one of the most amazing arts to be found in Florence. The images below are created from inlaid colored natural stone. The smallest start at 350 EU, for a piece about 3x4 inches, and the larger pieces were many thousands of dollars. I decided against putting out half a years worth of income for the one I loved most but so enjoyed looking at the artistry up close. Our meandering route led us almost by accident to the Piazza dell Repubblica, which has a long and incredible history. 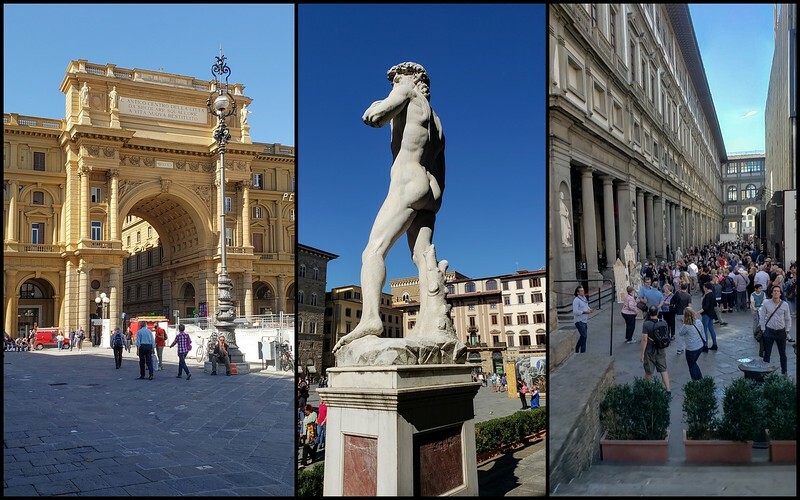 The statue of Neptune was in a state of disrepair, and as is the case with many displays of outdoor art in Florence was draped in tarps with photos depicting what we would be seeing if it weren’t all covered up. By this time, in this part of the city, the crowds were truly horrific and we were beginning to show some wear and tear on our bodies as well as our psyches. Wandering aimlessly to Piazza della Signoria we discovered the fake David (a truly awful rendition of the real thing) adjacent to the Palazzo Vecchio, the palatial Town Hall of the Medici. We spent a bit of time in the Palazzio Vecchio courtyard in the free zone, and skipped the paid tour of the interior. This was the original home of the Medici’s before they decided that it was too “dated” and moved their residences to the brand new Pitti Palace on the other side of the Arno River. We were both getting very tired and hungry. Wandering in the general direction of the river, we found another take away bakery with fresh, hot pizza slices. We later decided these were the best pizzas we tasted during our entire time in Italy, but we could never find that little bakery again. After devouring our pizza, we had another gelato before following the main road along the river back home to the apartment. 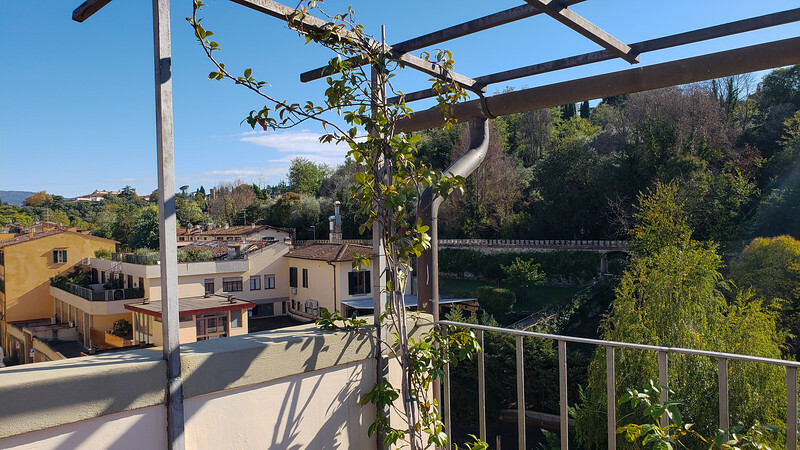 After napping a bit we settled in the warm sun on the terrace, made some calls to home and tried to decide it if was time to hike up to the Piazza Michelangelo for a traditional sunset view. Although this gorgeous and quite famous piazza is just blocks from our apartment, the roads leading there are winding and steep, including many steps and stairs and more switchbacks. I am ashamed to admit that even though we talked about it several times, this evening was our only visit to the famous square overlooking the city. As with most everything else we had experienced on this day, the square was very crowded. There is a small cafe but all the chairs were filled, and the open spaces along the walls were filled with people and cameras getting ready to shoot the famous view of the city at sunset. I am doing this just for fun, and as much for Deanna and for me as anyone else, but if you want to, check out the google map street view of the Piazza. You can walk all around and see it as we did with LOTS of people waiting for sunset and the view. There is another fake David in the center of the square, a somewhat newer addition to the city of Florence, only created in 1869. We looked at the bright early evening skies, not a cloud in sight for interest, looked at each other and said, “Nah, Tired, Home”. It truly was a gorgeous, expansive view of the great city that would no doubt be magnificent on a day with some clouds for interest, or on a day when we would be willing to wait another hour and fight the crowds for a photo. We had a perfectly lovely view of the quiet evening sunset from our very own terrace where our dinner consisted of an entire container of fresh green olives, tomatoes, and the last of our yogurts. Those olives are addictive, and every time we would run out of them we had to buy more. My goodness, I can taste them right now but have no clue where in the world I would ever find them here at home. Maybe some things are best saved in the memories of visiting Italy. 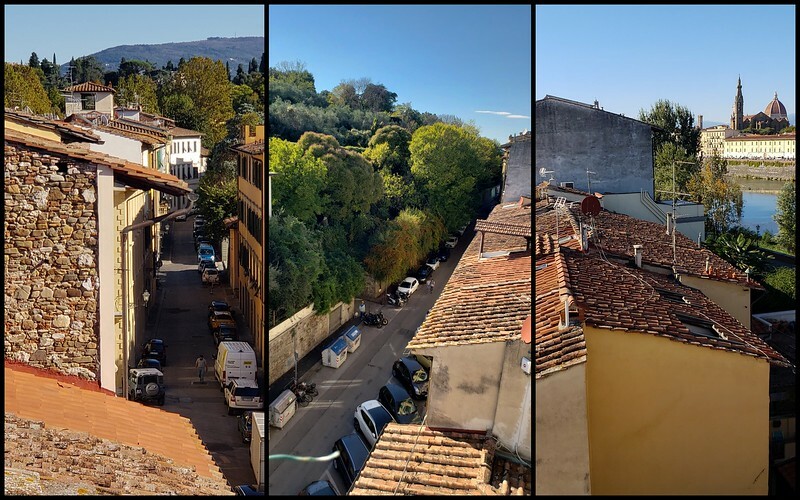 10-28-2018 How Will I Write About Italy?